Applications are invited from the eligible candidates to apply for 2019 NASA Internship in USA. It is inviting the students, who have the diverse background and they will spend 2 months in United States of America. The expenses for the paid internship will be covered and NASA internship in USA is the fully funded International summer internship program. The selected internees will not pay for anything during their internship program. The students, who have done with majors in Physical or natural science, computer science, engineering or mathematics, they can have the advantage but the eligible candidates with any academic discipline, they may apply. The duration of LPI summer internship program is about 10 weeks starting from 3 June 2019 to 8 August 2019. No IELTS or TOEFL is required if you get one letter from one of the professors in English department at the university, who confirms that you have sufficient spoken and writing English language skills. This letter, we call it the English Proficiency Certificate. LPI summer internship program in planetary science offers the opportunity to the undergraduate students to perform peer-viewed and cutting edge research and learn from widely respected planetary scientists and it also discovers the exciting careers in the planetary science. This program has the duration of 10 weeks and the students get the opportunities to take part in different activities like NASA Johnson Space Center scientific visits, lectures and career development workshops. NASA internship for international students is offered to international undergraduates and students from United States. College undergraduates with minimum 50 semester hours of credit interested in pursuing a career in the sciences will be considered as eligible. Students, who have done majors in physical or Natural science, Engineering, Computer science, or Mathematics, they can have advantage but any eligible student may apply. Provide proof of English proficiency. You may provide it in form of Test Of English as a Foreign Language (TOEFL), the International English Language Testing System (IELTS) score. OR Letter from one of the professors in the English department at your university, who will confirm that you have enough spoken and written English language skills, to successfully participate in our internship program. $7,300 Stipend: This amount covers internship stipend, Travel, Housing and cost of living expenses. $1000 Travel Stipend or $1,500 foreign travel reimbursement for foreign interns. 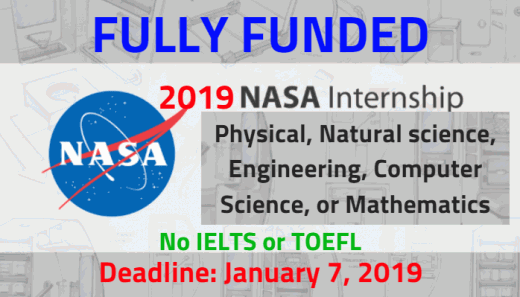 Additionally, financial support up to $1,000 is offered to interns, who submit accepted abstract as first author to the upcoming Lunar and Planetary Science Conference. Click on the link, which is given below in red color and you may proceed to NASA internship online application. When you begin the application, you must complete all of the questions on the form, including essay-style questions. You may submit transcripts and letters of recommendation independently. Upon submission, you will get confirmation e-mail with your application number and link to watch status of your reference letters. You are needed to submit three reference letters to qualify for the program. You can register your official transcript through college mail to: LPI Summer Intern Program, Application # 3600 Bay Area, Boulevard, Housten, TX 77058-1113. You should also include the application number in the address and provide to your register. For further information and contact, the link is given below and you can email them and ask any question.